The Bridge Care Suites offers a wide variety of lavish amenities to enhance the comfort and luxury of every guest’s stay. The beautifully designed architectural surroundings are only a glimpse of the extras that are available to our guests. A magnificently landscaped 5 acres and the custom décor give way to inviting common areas, spas, a theatre, a café, and so much more. Our unique dining experience lets our guests enjoy our chef’s savory creations in a beautifully decorated dining room, and our Active Living department ensures that a whole day’s worth of social activities and experiences are available to fill your day in between your therapy sessions, all available at your leisure! Aside from the beautiful surroundings and available amenities, all of our guests will have access to other features like free cable and WiFi services, spas and salons, access to nourishment stations stocked with snacks and beverages, and a whole array of other perks to enhance your stay. Our hospitality focused care model is designed to ensure that your stay with us is packed with all of the creature comforts of home and a host of extras to make this the most relaxing stay possible! We offer 3 room floor plans private, semi private and speciality. Each room boasts 178 square feet of living space with an additional private bathroom – complete with private showers in each room. Flat screen TVs with all of your favorite channels, plenty of storage, panoramic windows to let in a summer breeze or enjoy the colors of autumn on our incredible serene and beautifully landscaped acreage. Learn more or ask about our specialty room. Enjoy a fresh cup of latte’ or relax and enjoy a muffin and café mocha in the Café located inside The Bridge Care Suites. Coffee and good conversation are the centerpiece of so many relaxing mornings at home, and it goes without saying that most people need that first cup of morning joe before they start their day. Located just off of the Mainstreet Rotunda, our café is open to the public and serves up your favorite hot or cold beverages and a delicious assortment of sweet treats and a wide variety of health conscious snacks for every guest’s taste. 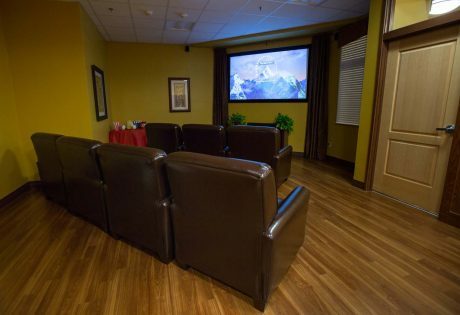 The Bridge Care Suites offers something that you simply don’t find in a healthcare facility…a theater. Guests at The Bridge can enjoy full length feature presentations while munching on their favorite snacks just like you would at the movie theater. The Bridge Care Suites offers a full theater with surround sound and a large screen for movie lovers and fans of the silver screen. Several movies are shown each day and a schedule of those will be available on your in-house information channel on your TV. Go to channel #2 for a list of movie times and what’s showing. 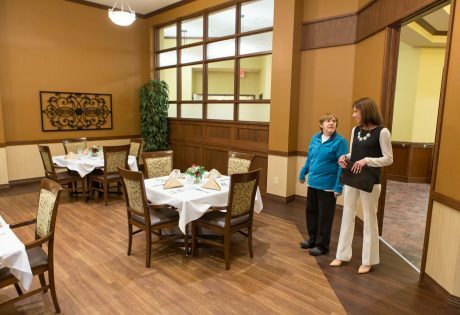 Dining is truly an experience at The Bridge Care Suites. Our Chef prepared meals are delectably created from the freshest ingredients and prepared by our culinary trained Chef to delight the palette and intrigue even the most refined taste. Guests of The Bridge have so many options for their dining experience. 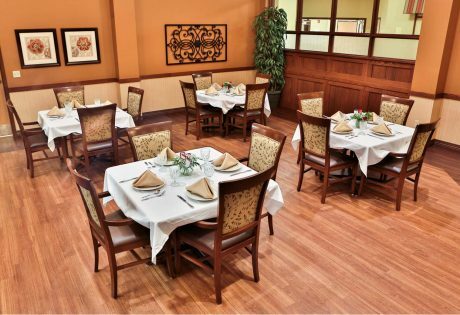 Guests can choose to enjoy each meal’s entree for the day in the warm surroundings of our dining area or can enjoy them as they are delivered by our room service staff to their room. Located just across from the Café is the Business center. A huge part of Active Living is the ability to stay connected with the outside world through social networking, email, and keeping up with world & local events. Our business center is free to all of our guests and provides a host of computers with internet access for those guests that need to keep up with their email, update their Facebook status, or simply surf the net for the latest YouTube videos. If you already have your laptop with you, don’t worry! Our entire campus has free WiFi available to all of our guests so you’ll be able to surf the net from the comfort of your room or from anywhere else in the building! 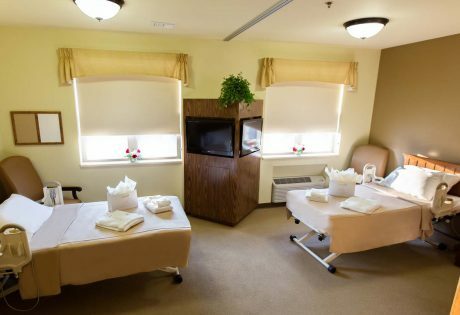 The Bridge Care Suites offers a unique experience by offering a full-service Salon within the Mainstreet Corridor of the building in addition to Spa Rooms within each of the guest suite wings. The Spa Rooms are equipped will a full guest shower for those that may require assistance in showering, but they also offer a unique therapeutic spa tub experience! Each of our Spa Rooms is equipped with this unique tub. The side of the tub lowers for each of entry for each guest, and when raised back into position, seals to allow the tub to be filled with water. A unique waterfall-like fill to the tub provides the initial hot-soak experience before the tub is filled and therapeutic whirlpool jets can be activated to provide a relaxing and carefree experience for those guests that enjoy the occasional “pampering time” in the tub. The surroundings in the Spas are enhanced with soft lighting, hand-laid decorative tiles, and relaxing earth tones for the full spa experience! A whole host of daily group activities is available through our Active Living department. Whether you’re a lover of computers, puzzles, crafts, or games – Active Living has you covered! With so many individual activities to choose from in the facility, we understand that having plenty of social interaction is of major importance to so many in the community. That’s why our Active Living department arranges a number of daily events to keep our guests entertained while they have the opportunity to mingle and socialize in their free time. A complete schedule of today’s events is available on your in-house information channel on your TV. The Bridge Care Suites offers complimentary transportation to our guests to and from all scheduled medical appointments. Guests of The Bridge Care Suties will typically have their medical appointments scheduled by one of our guest care staff members in order to meet their medical needs with physicians, surgeons, dialysis, or other medically necessary appointments. Our facility driver will arrive at your suite to pick you up and drop you off at your appointment promptly in The Bridge Care Suites shuttle van. We encourage a family member or friend to meet you at your appointments so that you always have someone available to assist you with paperwork or other items that your appointment location may need. Solutions for families that need extra care.